Forest hydrology combines aspects of two separate disciplines: hydrology and forestry. Hydrology is the science that studies the waters of Earth. Hydrology seeks to understand where water occurs; how water circulates; how and why water distribution changes over time; the chemical and physical properties of water; and the relation of water to living organisms. Forestry is the science that seeks to understand the nature of forests and the interactions between the parts comprising a forest. Forest management started in the 1700s as a form of large-scale farming to improve yields of timber and fiber from forests. In the United States, watershed protection has been an integral part of forest management since its origins. The Organic Administrative Act of 1897 stated that forest reserves were to protect and enhance water supplies, reduce flooding, secure favorable conditions of water flow, protect the forest from fires, and provide a continuous supply of timber. The 1911 Weeks Act authorized the acquisition of federal lands in the East for the express purpose of protecting the watersheds of navigable waterways. In recent decades, forestry has adopted more of an ecosystem management approach while still including timber production as an important goal. Although a forest is an ecosystem dominated by trees, a healthy forest includes other plants as well as soil, terrestrial and aquatic animals, and water—plus people who use the forest and its resources. Modern forest management therefore requires not only an understanding of forest science, soil science, and hydrology, but also principles of wildlife biology, land-use planning, and recreation planning. 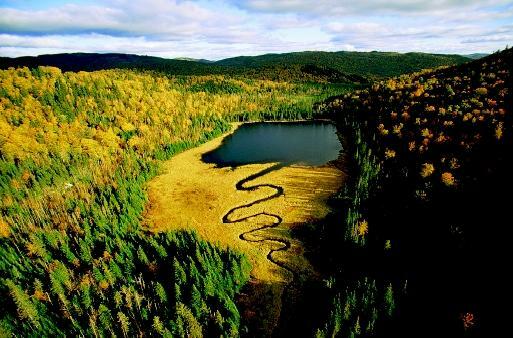 Undulating forest surrounds meadows, lakes, and rivers of the Charlevoix Conservation Area, a coastal watershed in Quebec, Canada. This region, which illustrates a high-quality forested watershed, has been designated a biosphere by the United Nations Educational, Scientific and Cultural Organization (UNESCO). and deposition. It also shapes the biological parts of the ecosystem by its presence or absence; its quantity and quality; and its occurrence and distribution. The water cycle plays a key role in ecosystem functions and processes. Forests, in turn, are vital to the water cycle and to water quality. In essence, the forest acts like a giant sponge, filtering and recycling water. Approximately 80 percent of U.S. fresh-water resources are estimated to originate in forests, which cover one-third of the U.S. land area. Tree leaves intercept water from rain, snow, and fog; the leaves also release water back to the atmosphere by evapotranspiration . Tree roots extract water from the soil while helping hold the soil in place. Forested land reduces the surface impact of falling rain through interception and delay of water reaching the surface. Forestland also decreases the amount and velocity of storm runoff over the land surface. This in turn increases the amount of water that soaks into the ground, a portion of which can ultimately recharge underlying aquifers . Conversely, water from hydraulically connected surficial aquifers may enter streams and wetlands , helping to maintain their water levels during dry periods. Forests and the Hydrologic Cycle. The surface water in a stream, lake, or wetland is most commonly precipitation that has run off the land or flowed through topsoils to subsequently enter the waterbody. If a surficial aquifer is present and hydraulically connected to a surface-water body, the aquifer can sustain surface flow by releasing water to it. In general, a heavy rainfall causes a temporary and relatively rapid increase in streamflow due to surface runoff. This increased flow is followed by a relatively slow decline back to baseflow, which is the amount of streamflow derived largely or entirely from groundwater. During long dry spells, streams with a baseflow component will keep flowing, whereas streams relying totally on precipitation will cease flowing. Generally speaking, a natural, expansive forest environment can enhance and sustain relationships in the water cycle because there are less human modifications to interfere with its components. A forested watershed helps moderate storm flows by increasing infiltration and reducing overland runoff. Further, a forest helps sustain streamflow by reducing evaporation (e.g., owing to slightly lower temperatures in shaded areas). Forests can help increase recharge to aquifers by allowing more precipitation to infiltrate the soil, as opposed to rapidly running off the land to a downslope area. The riparian zone is broadly defined as the area between a body of water and the upland parts of the landscape that are rarely flooded except under the most extreme conditions. But the term also can refer more specifically to the immediate streamside area. Riparian areas represent less than 10 percent of most forest ecosystems, yet these areas often are the most productive portions. Compared to upland regions, riparian areas have more water available; the vegetation is more robust; the soils are deeper; the timber often is of higher quality; and the waterbodies have more shade. The riparian zone also may include wetlands bordering streams and lakes. This combination of factors makes riparian areas among the most heavily used portions of a forest. Riparian and wetland areas provide abundant and reliable forage for wildlife, as well as transportation corridors. They also may receive heavy human use for recreation. Riparian zones also are attractive destinations for logging and for livestock grazing; as a result, riparian areas in forests are sometimes heavily damaged, especially in the forests of the arid American Southwest. Fortunately, riparian areas respond well to good management practices. Forest lands and waters are vitally important in maintaining biodiversity and providing habitat for fish and wildlife, including threatened or endangered aquatic species. In the United States, over one-third of national forest lands are critical for maintaining aquatic biodiversity and protection of listed species. For aquatic species, watersheds provide the basic unit of any conservation strategy. Many watersheds also contain isolated habitats with unique characteristics producing a high potential for rare species. Some species occur only near a single spring or in a single stream within a given watershed. Lands set aside to protect these unique habitats also benefit the entire watershed and its ecosystem. Rill and gully erosion caused by flowing water is evident on this steep slope following a forest fire. (Note the person crouching.) The soil loss can be substantial, and denuded slopes can be difficult to revegetate. as can land uses such as ski runs and housing projects. Many human activities can increase overland runoff, resulting in more erosion of the land surface and concurrently reducing the amount of water that soaks in the ground to potentially reach nearby streams or recharge underlying aquifers. Moreover, fire prevention and suppression have created "imbalanced" forests with excessive amounts of undergrowth and dead vegetative matter that serve as fuels when fire does occur. Hence, these forests are at increased risk of high-intensity, destructive fires. Watershed management and restoration may include controlled thinning, prescribed burning, and other management practices to restore the proper balance of timber, undergrowth, and grassy meadows in the watershed. Restoration also may include planting of appropriate native plants. 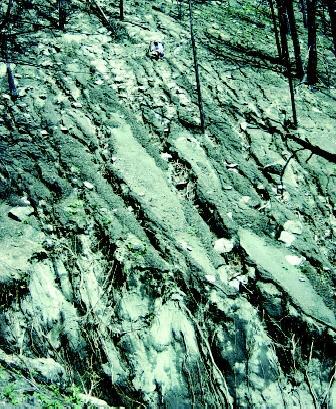 Improperly engineered roads in forests can increase erosion and significantly increase the risk of landslides. Both of the adverse effects are more severe when roads are numerous, and when they either cross or run parallel to streams. For example, heavy precipitation in Oregon and Washington during the mid-1990s resulted in many landslides, with a correlation between the slides and the frequency and density of roads. With respect to erosion and sedimentation, water runoff flowing along and across roads picks up sediment, which can then be deposited in nearby lakes and streams. This siltation can degrade or destroy habitat for aquatic organisms that require clear water and silt-free benthic (bottom) substrates. Proper road engineering and following good practices (such as the U.S. Forest Service Guidelines for Best Management Practices) can reduce or eliminate the risk of erosion, landslides, and stream degradation due to excess siltation. Unfortunately, many roads in U.S. national forests were built before the practices were in place. Destructive fires that remove large amounts of organic matter in a forest cause loss of nutrients from the soil as the detrital cover (i.e., dead and decaying materials on the forest floor) and upper soil layers are burned and eroded. Moreover, fires can adversely affect the quality of streams and lakes in the burned region as well as tributary watersheds downstream. Surface runoff that otherwise would have been slowed or absorbed by living and dead vegetative matter on the forest floor now runs unimpeded down bare (or nearly bare) slopes. The increased velocity carries more soil particles and loose vegetative matter downslope, along with any adsorbed nutrients. SEE ALSO Desert Hydrology ; Endangered Species Act ; Erosion and Sedimentation ; Fresh Water, Natural Composition of ; Groundwater ; Hydrologic Cycle ; Recreation ; Runoff, Factors Affecting ; Stream Health, Assessing ; Stream Hydrology ; Watershed, Restoration of ; Watershed, Water Quality in a .
Brooks, K. et al. Hydrology and the Management of Watersheds. Ames: Iowa State University Press, 1990. Hewlett, John D. Principles of Forest Hydrology. Athens: University of Georgia Press, 1982. Miller Jr., G. Tyler. Living in the Environment, 6th ed. Belmont, CA: Wadsworth Publishing Company, 1990. Perry, David. A. Forest Ecosystems. Baltimore, MD: The Johns Hopkins University Press, 1994. Spurr, Stephen H., and Burton V. Barnes. Forest Ecology. New York: John Wiley & Sons, 1980. The Hubbard Brook Ecosystem Study. <http://www.hubbardbrook.org> . Publications. U.S. Department of Agriculture Forest Service. <http://www.fs.fed.us/publications/> . well. it will be better to note the impact on hydrology (including the impact on drainage) with the increase of urbanization. Nowadays the forest is drasically being destroyed to meet the needs of growing population. I request you to include the all hydrologic impacts as the result of forest degradation including ground water potential.